alaTest has collected and analyzed 24 reviews of Panasonic NV GS 55. The average rating for this product is 4.2/5, compared to an average rating of 4.0/5 for other Camcorders for all reviews. Comments about the zoom and image quality are overall positive. The size and usability also get good opinions, but views are divided on the price. We analyzed user and expert ratings, product age and more factors. Compared to other Camcorders the Panasonic NV GS 55 is awarded an overall alaScore™ of 76/100 = Good quality. alaTest has collected and analyzed 6 user reviews of Panasonic NV GS 55 from Amazon.com. The average user rating for this product is 3.7/5, compared to an average user rating of 3.9/5 for other Camcorders on Amazon.com. People are impressed by the image quality and size. The usability and portability are also mentioned favorably, whereas views are divided on the price. 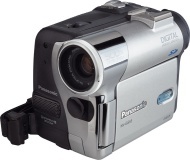 The Panasonic PV GS55 is a Ultra-Compact MiniDV Camcorder with a 10x Optical Zoom. Panasonic PV GS55: OpticsThe PV-GS55 is equipped with a 1/6-inch, 680,000-pixel CCD and 10x optical zoom It also features a 800x digital zoom that allows you to zoom in on incredible close-ups. Blending innovative technologies with new, simple-to-operate controls, Panasonic's Ultra-Compact PV-GS55 camcorder combines industry leading optical zoom ratios, in a small form factor that allows for video recording just about anywhere. The PV-GS55 Palmcorder Multicam was designed to simplify camcorder operation for the video novice and professional videographer alike, and includes high-definition optical zoom and digital zoom capabilities and ease of operation through newly designed layout and controls. For use in the digital still camera mode, Direct Mode Dial easy-access dial control lets users quickly select the desired digital camera mode, such as Record, Playback, Card Record or Card Playback. An LCD screen that can be opened a full 120 degrees away from the camcorder's body makes it easier to view motion images as they're being captured. The new model is a video camera first and foremost, and is well appointed with features to produce sharp digital recordings. For example, the image-enhancing MagicPix feature allows for rich videos under low-light conditions. Digital Electronic Image Stabilization (EIS) helps take the jitter out of hand-held video recording and compensate for unintentional hand and camcorder movement. The PV-GS55 also features Soft Skin Detail function.